Yes, my first reaction was "What ?" as well. I actually first came across this (after a fashion) in Bitsavers.org, the repository of old technical documents. For some reason I can't remember I was looking for the datasheet of the AY-3-8500 - the GI Chip that made Pong consoles cheap : the Pong on a chip which required a few discrete components to make a game console. Out of interest, I read it, and almost uniquely for a chip datasheet it was funny. The idea that anyone, anywhere would spend money designing a console that would do this was ridiculous. Even from reading the spec you could see that such a machine would be - limited. On the off chance, I googled for it, and to my surprise found that someone had and it had been (partly) documented through the work of David Winter "Mr Pong" and Sylvain DeChantal, aka SlyDC, FAQ writer for systems you've never even heard of. 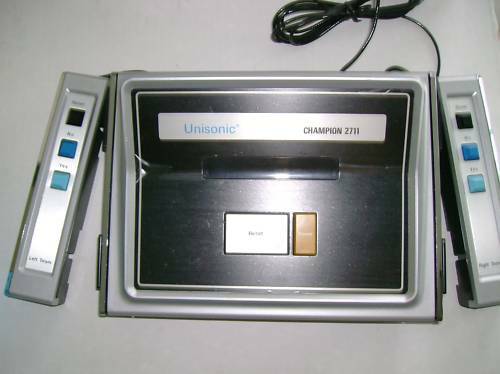 The Unisonic Champion 2711 is the only machine ever to use this chip. It's actually quite valuable despite it's sheer awfulness, because it is estimated that at most 500 of these were made (this is guessed from serial numbers on known machines), which makes it worth money on rarity grounds. Let's not be totally negative. There are some upsides to this machine. Well, one. (The case design is quite nice, albeit it was nicked from one of their other machines, so perhaps that's two). Even looking at this picture there is one obvious, gob smackingly silly piece of design, which makes it useless as a games machine. If it had the same graphics and CPU hardware as a Playstation 3, you still couldn't play Pacman on it. Is this the worst console ever (Part 3) ? Is this the worst console ever (Part 2) ?